The T-Mobile G-Slate will bring 3D flavors to the Android tablet market starting April 20, when the device goes on sale for $529 (after a $100 mail-in rebate). Sporting an 8.9-inch display, the G-Slate aims to differentiate itself not only in size from the 10-inch and 7-inch tablets, but also by featuring two cameras on the back to shoot 3D videos and watch them on the display (with special glasses). The G-Slate has a Nvidia Tegra 2 dual-core processor, two 5-megapixel cameras with LED flash that can shoot 1080p HD and 3D videos. The display is 8.9-inch, there's a front-facing camera for video calls, 32GB of internal storage and a 4G radio chip for T-Mobile's network. The G-Slate will run Android 3.0 Honeycomb. The G-Slate costs $529 with a two-year contract ($750 unsubsidized), which is $200 less than the equivalent (3G-enabled) iPad 2 versions, and $70 less than Motorola's Xoom. Research In Motion's 7-inch PlayBook tablet (launching Tuesday), will start at $499 for the WiFi models with 16GB of storage. The T-Mobile G-Slate arrives in an increasingly crowded iPad-clone market, where manufacturers are scrambling to come up with more attractive alternatives based on the Android OS. With one day to go until the G-Slate arrives, reviewers got their hands on the tablet to see whether it has any chance against the iPad. Zach Epstein reviewing for BoyGeniusReport writes: "I don't see the G-Slate going very far with average consumers. It's also a bit pricey at $529.99 with a two-year data contract. Honeycomb tablets don't have much competition yet, but the G-Slate will likely still be near the top of the heap even once more competition begins to trickle out." Tim Stevens over at Engadget wrote in his G-Slate review that "The plastic back doesn't quite have that air of exclusivity you might want for your $530, but that money's going where it counts: great performance, a great screen, and solid battery life." Stevens also points out the $529 price tag has a caveat: "You only get that price if you already have or sign up for a T-Mobile voice plan. No voice plan? No rebate, so you're looking at a price of $630. Want to opt out of the data plan, too? Now you're looking at an unsubsidized price of $750." 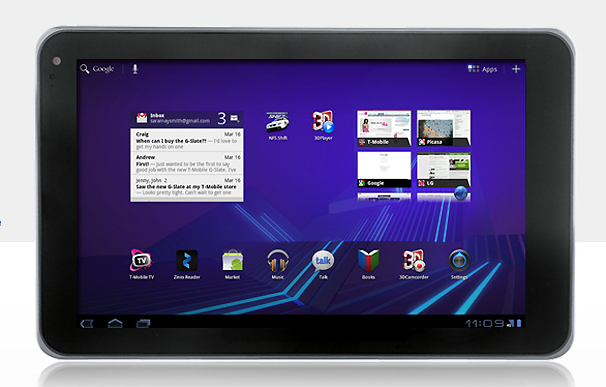 Some reviewers are comparing the G-Slate to the Xoom (above). Vincent Nguyen tested the G-Slate for SlashGear and pointed out that "Honeycomb still falls short of being mass-market ready, though it's certainly full of promise. The G-Slate makes - with things like Flash Player support out of the box - a better first-impression than the Xoom managed, but it still lacks the general appeal of the iPad 2. A few solid firmware updates could address that, but it will take T-Mobile chiseling away at the G-Slate's price before we could wholeheartedly recommend the tablet." Kevin Tofel reviewed the G-Slate for GigaOm and believes that "T-Mobile offers a solid hardware package in the G-Slate, which should get better as Android matures on tablets. Since the 8.9-inch slate doesn't fit in a pocket and weighs as much as an iPad 2, some may opt to just go for a larger tablet. However, folks within T-Mobile's HSPA+ coverage areas will find much to like, provided they don't mind waiting for Google's software to catch up to the G-Slate's capable hardware." Chris Burns from Android Community says: "The only thing I'd caution you against is the connection speed. We didn't experience the best day of our lives downloading around the city with the T-Mobile 4G SIM, but maybe T-Mobile works a lot better in your area - that's up to you to find out. The tablet feels great, it runs Honeycomb without a hitch, and you're going to have a good time shooting some 3D video if that's your bag." Mark Spoonauer sums up his review at LaptopMag : "In fact, we prefer the G-Slate in some ways to the Motorola Xoom because it has a better display and it weighs less (even though you get a smaller screen). To us, the 3D camcorder and glasses are just a bonus -- and not a very compelling one at that. The Xoom is better for those who want faster 4G speeds, but Verizon hasn't yet made that upgrade available."